For over two decades Tonal Harmony has been the leading text for the two-year theory curriculum for music majors. Used at nearly 800 schools, Tonal Harmony has been consistently praised for its practicality and ease of use for student and instructor alike. The straightforward approach is supported by well-chosen examples and thoughtful exercises, and the total presentation is compatible with differing teaching styles and theoretical points of view. In addition, students can purchase a CD of recorded examples for use with the textbook, while audio examples for the workbook are available for download as MP3 files. For instructors, an extensive Instructor's Manual is available and rounds out this comprehensive teaching package. Simplified discussion of Mode Mixture and Neapolitan Chord. Condensed coverage of Augmented Sixth Chords to one chapter. 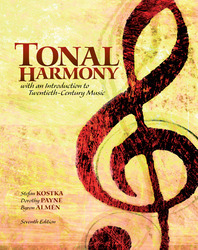 Wholly revised examination of Tonal Harmony in the Late 19th Century by new co-author Byron Almén. Many new examples have been added across the textbook and workbook. Musical examples are drawn from a wide range of repertoire, and the majority of the selections are available in recorded form on CD (textbook) or via download (workbook). Notational highlights (unique to this text) indicated in a second color point out key passages in the notational examples. Coverage of species counterpoint appears on the Online Learning Center. A companion workbook, available for separate purchase, provides assignments for each chapter of the text, helping students master the content. Selected exercises are available in Finale templates though the Online Learning Center and each new copy of the workbook comes with a discount code for purchase of Finale notation software at a special low price. Recordings for the textbook are provided on an optional CD set, and selected Workbook examples are available as free MP3 downloads. Each recording is performed using the instruments mentioned in the example within the text.